Originating in the Southern region of the United States, the Black Mouth Cur breed was developed to be an all-purpose working dog that contributed to the family. Highly regarded for their hunting skills of squirrel, raccoon, bear, boar, and mountain lion, they were also utilized for herding cattle and as guard dogs. Although the Black Mouth Cur is a fine companion, they are first and foremost a working breed. 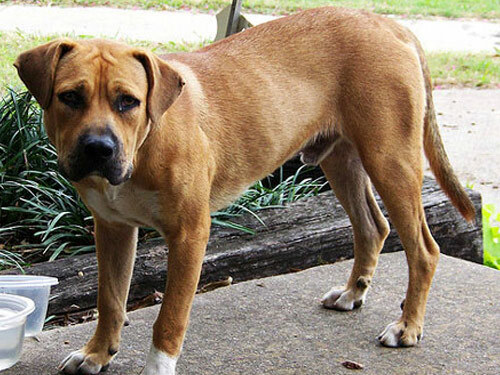 The Black Mouth Cur is muscular, well-balanced, tenacious, and courageous. This breed is built for power, speed, and agility. Black Mouth Cur's are rugged, sturdy, and relentless. They are highly proficient at swimming, tracking, treeing, and baying. The Black Mouth Cur is loyal, active, and even-tempered. They do best in a home with older children due to their propensity to herd. Black Mouth Cur's do well with other dogs provided they are not classified as a Toy breed. They are not recommended for homes with non-canine pets. The Black Mouth Cur is highly protective of their family, home, and territory and will fight to the death to defend those they love. This breed is exceptionally affectionate to women. The Black Mouth Cur breed requires occasional brushing with a firm bristle brush will minimize loose and dead hair. Bathe only when necessary using a mild shampoo to prevent drying of the skin. It is important to regularly check the ears for debris and remove excess hair. The nails must be regularly clipped. This breed has no known health issues. The coat of the Black Mouth Cur is short, straight, smooth, and fine. This breed sheds little to no hair. The Black Mouth Cur is extremely sensitive and intelligent. Obedience and socialization training are recommended. However, this breed does not respond to harsh or heavy-handed methods. Black Mouth Cur's do best with short and varied sessions to prevent boredom. Training must be done with fairness, respect, and consistency. The Black Mouth Cur is not recommended for apartment or city living. As a working and hunting breed they require an inordinate amount of mental and physical activity. This breed does best in a rural setting or a home with a large securely fenced yard.